In the documentary film, “The Man Who Stopped the Desert,” a farmer named Yacouba Sawadogo struggles to maintain his livelihood in the increasingly harsh land of northern Burkina Faso. Part of Africa’s semi-arid Sahel region, Burkina Faso has suffered from desertification as over-farming, overgrazing, and overpopulation resulted in heavy soil erosion and drying. Desertification has affected many countries in the Sahel, including Senegal, Mali, Niger, and Chad. In 1980, Yacouba decided to fight the desert’s spread by reviving an ancient farming technique called zai, which led to forest growth and increased soil quality. Zai is a very simple and low-cost method, involving using a shovel or axe to break up the ground and dig small holes, which are then filled with compost and planted with seeds of trees, millet, or sorghum. The holes or pits catch water during the rainy season and, when filled with compost, retain moisture and nutrients through the dry season. 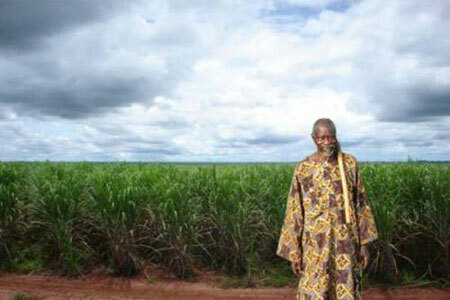 Yacouba’s story attracted international attention when Mark Dodd of 1080 Filmscreated the documentary in 2010, and the African farmer has since told his story around the world, including at an October 2012 United Nations Convention to Combat Desertification (UNCCD) meeting in South Korea. 1080 Films recently released a short follow-up film about Yacouba’s life since the original film, called “What Yacouba Did Next…,” describing what Yacouba has done since the film’s release and giving an idea of the respect he has received from the international community. One direct benefit of the documentary has been the donations Yacouba has received in support of his reforestation efforts. As a result, he has been able to fund a new training program, where he travels to other villages teaching the zai technique. Yacouba hopes to spread this knowledge across the region, and has already visited 13 villages. He also hosts workshops at his own farm, teaching visitors and “bringing people together in a spirit of friendship.” “I want the training program to be the starting point for many fruitful exchanges across the region,” says Yacouba. Since the film, however, life has not been easy for Yacouba. A recent urban expansion project annexed the forest he spent years growing, and homes are already being built on his land without any compensation except small parcels of land for Yacouba’s family. He is currently attempting to raise US$20,000 to purchase the forest back. Despite these setbacks, Yacouba knows the importance of his work and has doubled his cultivation efforts, expanding into the degraded lands next to the forest. Restoring soil and improving the future of the Sahel will not be easy, but Yacouba’s work provides one model for communities across Africa to adopt in fighting desertification and preparing for future climate uncertainties.